(Press release) — The Turkmenistan Special Operation Forces has awarded a multimillion-dollar contract to Polaris Government and Defense for military and commercial vehicles. The Polaris vehicles provide mobility options to their combat commanders to pose multiple dilemmas to the enemy. 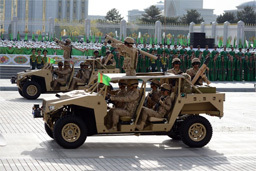 Polaris’s vehicle were showed during the Turkmenistan independance day parade. According to Polaris, The MV850™ is loaded with features which make it as comfortable as it is powerful. Operators experience less fatigue because the MV850 provides the smoothest, most responsive power steering available in an all-terrain vehicle, variable assist for easier steering and active descent control and engine breaking system work together to monitor and control descent and deceleration. A powerful engine, two fuel tanks and 270 kg of total rack capacity make it optimal for long distances. Polaris Government and Defense has other military customers in Central Asia including Afghanistan, Tajikistan, Philippines, and Malaysia.